weincasting! » Dr. Niles Crane Quotes X.
Niles: Em, our wine club is having a vertical tasting at the ‘Opus One’. Martin: Oh, well, don’t drink too much. Niles: It’s not like that, Dad, you don’t actually drink the wine. You just swish it around and spit it out. Martin: We all did that at Duke’s New Year’s Eve party. Of course, it wasn’t wine, it was egg salad! Dr. Niles Crane is a fictional character on the American sitcom Frasier. 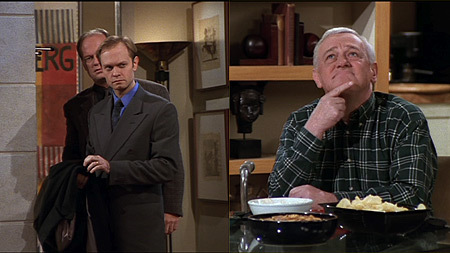 Martin is the father of Niles.